The loan is reimbursed in one installment at the maturity date of the project (principal and possible interests). Note: additional time may be necessary for the funds to be credited on the lenders' accounts due to delays in international transfers. Mi nombre es Gramer, vivo junto a mis padres en la localidad de Carumas que esta ubicado en Moquegua. Me dedico a brindar servicio de transporte urbano en mi vehículo que con mucho esfuerzo logre comprar, solicito el microcrédito para arreglar mi vehículo así mejorar la calidad de servicio que ofrezco. En un futuro deseo mejorar mi situación económica y seguir contando con buena salud. With Peru's fast growing economy, the land of the Inca's is helping the global fight against poverty and inequality to gain momentum. This loan is managed locally by our field partner Fondesurco which is in charge of administrating the loan and repaying MicroWorld lenders. You should be aware that lending involves a risk of non-repayment. However, the risk associated with this MFI is considered lower than average. This loan does not pay any interest to the lender. The MFI will reimburse the lender in case of default of the entrepreneur but there is no guarantee or insurance given by the MFI. 100% of the money collected is sent to the MFI, even if the project is not fully funded on the site. The MFI then makes a loan to the micro-entrepreneur and charges an interest rate in order to cover its operational and financial costs. The platform earns a commission from the MFI for the service it provides, which helps to fund its running costs. More effective than a simple donation, micro-credit promotes long-term sustainable economic development rather than short term help. Fondesurco, an NGO, was established fifteen years ago following a pilot microcredit program initiated by a set of four NGOs operating in the southern region of the country. The project began with group loans that followed the Grameen Bank methodology. 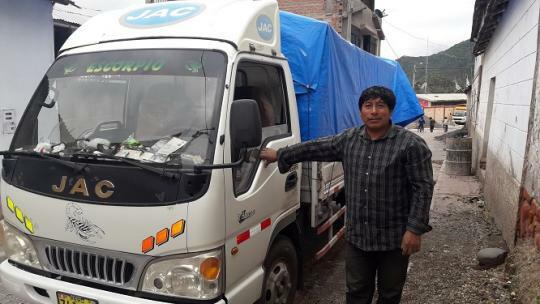 The MFI has developed the majority of its business in the province of Arequipa, supporting agricultural activities in the Andean highlands, and is trying to deepen its presence in this region by offering services to the most remote villages.